Context includes all the possible parts that one could analyze about a situation. 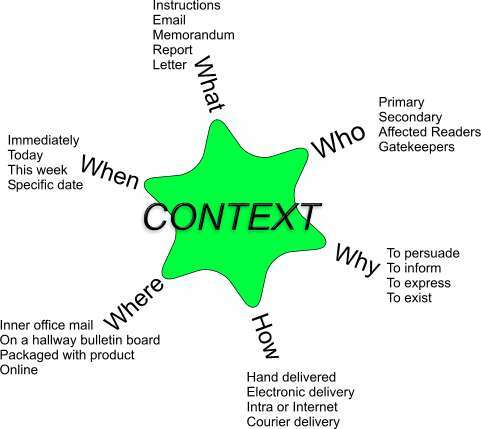 To simplify, we can use the five W's and H of journalism: What, When, Where, Why, Who, and How? For the sake of my acronym, CAP, and to emphasize their level of importance in a document analysis, I segregate the Who and call it Audience and the Why and call it Purpose. We need to fully understand the context of a given document situation in order to make the correct choices. Consider what kind of material should be used to print tire changing instructions that will be kept in a vehicle's tire well and may be read on a snowy, windy night compared to the kind of material that should be used for a company's annual report. Even if you expect to publish on 8.5 X 11 copy paper, consider where and under what conditions--including lighting--that your audience will be reading. When will the document be drafted? When will the document be reviewed? Who will be exercising quality control? When must the document be published? How will the document be published? Will a copy of the document be kept by the organization for later access? Will the document be public or private? Just in case the implied message is not clear, here is the explicit message of this page: Writers must decide what analysis questions to ask, what data about the document situation to gather and record, and how to apply what they have learned in the analysis process. We do not have a one-size-fits all template or solution. Start with the questions you are given here, but plan on building your own methods of expanding on these to generate the picture you need to do the job you have been assigned. Yeah, analysis is partly mechanical but develops into an art. What document have you encountered that was useless to you because you could not read all of it? For example, have you driven past a highway sign that contained too much text for you to read in the time you had available? Analyze the document situation and describe ways to improve the document for readability. Next visit the pages CAP HOME, AUDIENCE, or PURPOSE.